TUNIS, Tunisia - Thousands of angry demonstrators marched through Tunisia's capital on Friday to demand the resignation of the country's autocratic leader, and hundreds of foreign tourists were evacuated amid fears of more unrest. Protesters chanted slogans against President Zine El Abidine Ben Ali, including "Ben Ali, out!" and "Ben Ali, assassin!" One poster read "We won't forget," a reference to the rioters killed, many by police bullets. Pent-up anger at unemployment and at a leadership many see as controlling and corrupt has exploded into protests and clashes with police over the past few weeks. The official death toll in the riots is 23, but opposition figures say dozens more have been killed. U.S. diplomatic cables released by WikiLeaks have described the corruption in Tunisia, and social networks like Facebook have helped spread the comments. Many ordinary Tunisians who have complained of corruption for years felt vindicated to see the U.S. cables. Hundreds of police with shields and riot gear blocked the avenue Friday in front of the Interior Ministry, where over the years there have been reports of torture. 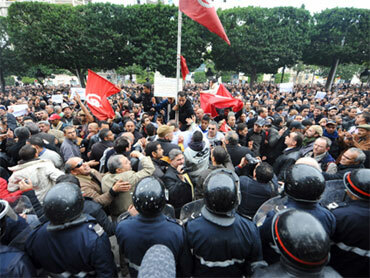 The march was organized by Tunisia's only legal trade union, which also went ahead with a symbolic two-hour strike. Medical officials told the Associated Press of 13 more deaths late Thursday. Surgeon Fares Belhassen said he had counted 10 dead and 50 wounded at Tunis' Charles Nicolle hospital. An employee at Khereddine Hospital, who spoke on condition of anonymity, said three more people were shot to death and six others injured by police in clashes in the northern suburb of Kram. Facing the worst unrest in his 23 years in power, an unusually contrite Ben Ali went on television Thursday, making sweeping pledges for political and media freedom. He also promised to leave the presidency when his term ends in 2014, and ordered prices on sugar, milk and bread slashed. After he spoke, thousands filled the main tree-lined Avenue Bourguiba, cheering "Long live Ben Ali!" honking horns and waving flags. Many people demonstrating Friday claimed the pro-Ben Ali rally on Thursday - which broke a government-imposed curfew - was staged by the powerful ruling RCD party, which paid jobless youths to participate. They claimed many of the cars that cruised the avenue, some with passengers standing on the car roofs, bore the blue license plates of rented vehicles. "That was all prepared in advance," said Haitem Ouerghemi, 30, a call center worker. "It was a Hollywood scene." The protests started in mid-December in the provinces, but this week reached Tunis, the capital of this North African tourist haven on the Mediterranean. British tour operator Thomas Cook said Friday it was evacuating 1,800 tourists from the country, known for its beaches, desert landscape, ancient ruins and bustling bazaars. In Friday's protest, crowds sang the national anthem, fists in the air. "We want to end this dictatorship," said Wadia Amar, a university chemistry professor. "The Ben Ali clan should be brought to justice. They've taken everything." The ruling party remains a powerful machine despite the weeks of riots. It was not clear how much impact Ben Ali's speech had on the unrest. In a country with a tightly controlled media, Friday's French-language daily Le Temps touted Ben Ali's speech as a "historic turning point." "After the blood and desolation, happiness and, once again, hope," the paper said in red on its front page. It was impossible to measure the real strength of opponents. The concessions by the president could play a role in appeasing some opponents, but not everyone. "A month ago, we didn't believe this uprising was possible," said Beya Mannai, a geology professor at the University of Tunis. "But the people rose up." Ben Ali, who came to power in a bloodless coup in 1987, has prevented potential successors from emerging, sent many opponents to jail or into exile and clamped down on the media and social networking sites. Police have repeatedly opened fire on rioters. The International Federation of Human Rights Leagues, known by its French acronym FIDH, said Thursday it has tallied 66 dead in the unrest so far, including seven people who killed themselves. European governments and the United States have warned citizens about travel in Tunisia.